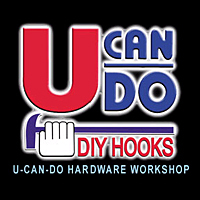 The U-CAN-DO Hardware Corporation has been manufacturing hard wall hangers, metal picture hangers, all-purpose hooks, wires, nails and screws in all sizes for more than decades as an OEM supplier. Our high quality and good service have earned us an esteemed reputation for honesty and integrity with our customers. Since 1994 we have established our own logo which is:"U-CAN-DO" in the field of the DIY hardware market. The presentation of excellent products has been our goal. We welcome you to advise us of your need anytime. You may contact us by e-mail or fax. It would be our great pleasure to serve you. Feel free to direct any inquiries or request for service at any time. Bulk purchases or small quantities are welcome. We also give you the choice of packaging with your own logo and designs or you may choose U-CAN-DO designs. We guarantee you the best quality and finest service possible. Cooperative efforts would assure the greatest profits which we could share in the coming year. Your best business choice would be to work with U-CAN-DO. Just contact us now. We can be the most effective by working cooperatively with you for a better future. Multiple options are available-blister packaging, flexkits designs, compartment-box presentation, polybag types and of course bulk packaging are all available.